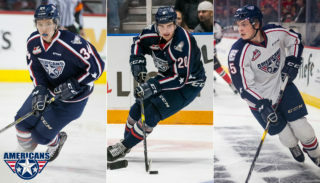 Kennewick, WA – The Tri-City Americans are proud to announce that Michael Rasmussen, Juuso Välimäki, Morgan Geekie, and Kyle Olson have been drafted by the Detroit Red Wings, Calgary Flames, Carolina Hurricanes and the Anaheim ducks (9th, 16th, 67th, and 122nd overall respectively). All were selected at the 2017 NHL Entry Draft, held today and yesterday at the United Center in Chicago, IL. This is the first time since 2004 that four or more Americans were taken in the NHL Draft. 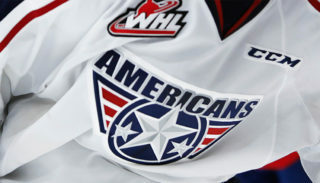 The Americans tie with the Portland Winterhawks for most players selected at 4 for each team. Michael Rasmussen, the 6’6” 215-lb center from Vancouver, BC, just finished his second season with the Americans, appearing in 50 games. He racked up 32 goals and 55 points along with 50 PIM. Prior to leaving the ice due to injury, Michael was playing at a breakneck pace. He led the league in Goals and Power Play Goals for period of time and ended the season with the second most Goals on the team and most Power Play Goals on the team. Juuso Välimäki, the 6’2” 201-lb defenseman from Nokia, Finland, just finished his second season with the Americans, appearing in 60 games. As a two-sided D-Man, Juuso finished the season 19 goals and 61 points, good for 4th most on the team. Juuso’s top qualities are his speed and hockey sense. He can easily jump into a rush, transition back defensively, and make a solid play to relieve pressure or generate a scoring chance. Morgan Geekie, the 6’2” 190-lb center from Strathclair, MB just finished his second full season with the Americans, appearing in all 72 games. Morgan was one of the few overage standouts in the draft. After being passed over last season, he finished this season with 35 goals and 90 points, good for most points on the team. 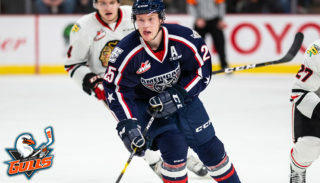 His superior work at the NHL Combine earlier this month and his blossoming abilities that were on display this last season made him stand out to the NHL Scouts. Kyle Olson, the 5’10” 161-lb forward from Calgary, AB just finished up his second season with the Americans, appearing in all 72 games. The small, fiery forward scored 20 goals on the season and finished with 57 points on the season. Kyle caught fire midway through the season, earning three playmakers in four games. He thrives on speed, bouncing around and generally creating chaos on the ice. 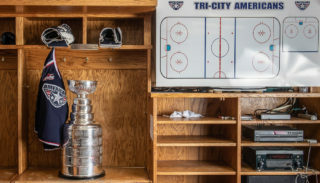 Tri-City Americans season tickets for the 2017-18 WHL campaign are now available. For details on ticket packages and exclusive privileges such as our Never-A-Wasted ticket exchange program, contact our office at (509) 736-0606 or visit us inside the Toyota Center.